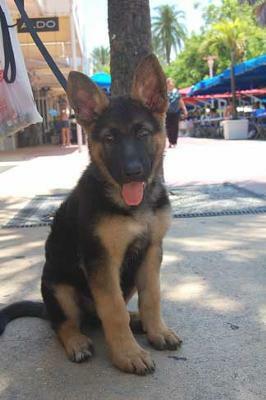 Hi, Here is a photo of my New GSD named Zak when he was only 10 Weeks Old!! He is already well behaved for his age, house clean and a very calm dog for his age. He responds to many commands such as sit, down, leave it, and take. he walks also very good with a leash. He just turned 3 months on June 7th!! so as you can see, i am a very proud gsd owner. I also get sooooo many compliments about how beautiful he is and how early his ears were standing up on their own. He is the most beautiful GSD i've ever seen, Have you got new pictures?